Roosevelt was a Republican activist during his years in the Assembly, writing more bills than any other New York state legislator. The 1884 Republican National Convention was a presidential nominating convention held at the Exposition Hall in Chicago, Illinois, on June 3-6, 1884. It resulted in the nomination of James G. Blaine and John A. Logan for President and Vice President of the United States. The ticket lost in the election of 1884 to Democrats Grover Cleveland and Thomas A. Hendricks. In attendance were 1600 delegates and alternates and 6000 spectators. There were 820 official delegates; 411 votes were needed to win the nomination. Blaine was the favorite going in, but there was a possibility that incumbent Chester Arthur could build a coalition with smaller candidate such as George F. Edmunds. There were also rumors that members of the Party would bolt if Blaine won the nomination. Neither Blaine nor Arthur were in attendance. Blaine was at his home in Augusta, Maine and Arthur followed the events from the White House by telegraphy. To test the waters Blaine supporters nominated Powell Clayton as temporary chair of the Convention. A former Arthur supporter, Clayton was now in Blaine’s camp. He was popular with veterans, but was also associated with the Star Route Frauds. Edmunds supporters, led by Henry Cabot Lodge moved to nominate John R. Lynch instead, an African-American from Mississippi. 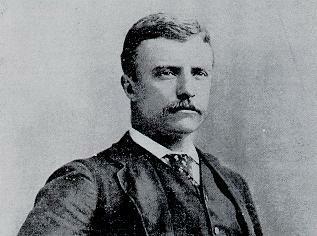 The speech supporting Lynch was given by Theodore Roosevelt. Lynch won the vote 424 to 384, and Blaine’s nomination seemed for the first time vulnerable.